Create a Connection Even Before Your Guests Arrive. 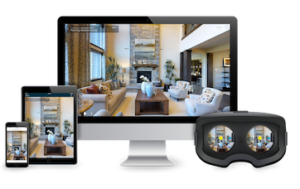 ShowcasePros’ Matterport Immersive True3D™ Tours are complete experiences that give your online visitors an accurate sense of your accommodations and amenities. They are created from real 2D and 3D data about your properties, and you can embed the Walk-through in a website just like photos and videos. With Immersive 3D Media, your guests know that what they’re seeing online is actually how it looks in real life. 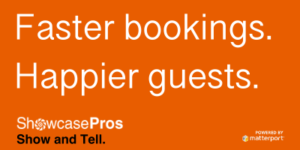 With more realistic expectations, guests are confident, happier, and more likely to book. Empower event planners to discover the perfect venue by giving them a complete understanding of your space. You’ll save time and money by giving them a complete feeling of your venue, right from their computer or mobile device. 3D Showcase is easy to share. Embed it on your website just like a video, and share it anywhere via a simple link. Visitors explore through their web browser — no additional apps or downloads necessary. Matterport is the only way to give vacationers and event planners total confidence that your space is the right fit. Ensure that expectations meet reality by offering the most accurate, immersive virtual experience of your space. We attract and engage online audience by creating virtual tours for businesses and venues. We provide an immersive 3D experience that is always on — even when you’re not. Your customers and prospects will get to know your atmosphere — connecting with you even before they arrive. Your tour is available on any connected device. Immersive tours are interactive increasing time spent on your company website or social media post. It is highly-sharable including Facebook, Twitter, LinkedIn, , and Pinterest. Sharing also includes email and text message. We published on Google Street View, Google Maps and Google Business Page. Our service includes a professional image capture walk-through visits, fly-through visits, and custom multimedia annotations. Industries: Real Estate, Public and Cultural Spaces, AEC, Travel and Hospitality, Retail and Restaurants.